Last week was a busy one for us! we celebrated Autumns birthday twice, once on her actual birthday with family then on the weekend with all her little friends! On her Birthday we had family over and enjoyed pizza and a yummy ice cream cake, she loved opening up her presents and got a book, a bunch of barbies with clothes and a unicorn, a snow white costume, a toy vaccumm, and colouring set! 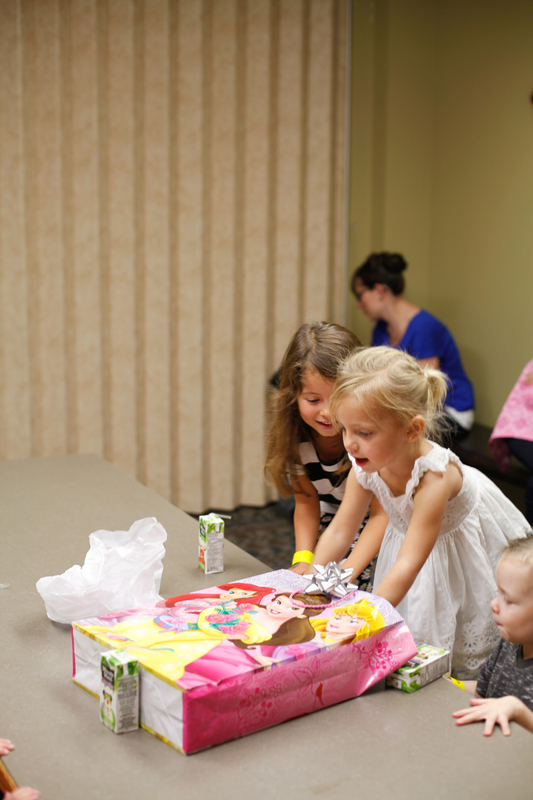 She was so excited about all of her presents and they kept her busy until her birthday party on the weekend! Her party on the weekend I wanted to do something easy and something out of my house so I don't have some big thing to set up and clean up! We had it at fun n more and it was a great decision, all the kids were off playing through the tunnels, climbing and going on the slides, after playing for an hour we got our party room where we had cake and presents! She got so many fun toys and had a blast with her friends, it was such an easy birthday party and I'm so glad we didn't do it at home, I think the kids had way more fun! I didn't take too many pictures of the kids and they were busy busy, but I managed to snap a few! So glad my girl felt so special and got the fun birthday she deserved. xox we love our little lady. the big girls (Autumn and Lola) loved holding scarlett and holly!! Autumn got this really fun craft, make your own fairy garden, we had so much fun painting it and setting it all up, now we will see if the seeds grow! I figured I would also give a few updates on our little baby! The past few weeks this little man of mine inside me has been quite the uncooperative baby! I had 3 ultrasounds in the past week and half and i am SICK of them, but thankfully I am done but of course in a week or two ill be back for my regular vaginal ones...yay can't you tell how thrilled I am about ALL the appointments I have. So at my first gender reveal ultrasound they couldn't get a good picture of the heart because he was in a funny position so they said come back next week, and I figured well the heart is kinda one of the most important organs in the body we probably need to get a clear picture of it, so I went back the week after, after waiting an hour and half for my appointment i was furious and surprise surprise the tech said oh I can't see it you'll have to come back in a few days. I was so upset because I just wanted to get these pictures over with and the baby only has a small window of when they can see it really clearly, from week 18-20 and I am already 20 weeks so my appointment on monday I was worried they wouldnt see it. Thankfully I had a wonderful tech who wouldn't give up on the baby and kept me in the room for over an hour, at first he said we cant see it, so he had me turn on the side, left then right then back and was constantly tapping my belly to get my baby to move, finally on the right side he was pushing really hard and was able to get the baby to turn a teeny bit, just enough to get some super clear pictures of his heart and I could see all 4 chambers very clearly, that made me really happy! I was so glad he kept trying so I didn't have to come back, i guess the baby has his head down and spine up and is very straight, so if its never on the side they cant see the heart very well, and if people don't think I'm already big enough, my placenta is right underneath my belly button, making me show even more and the past 3 ultrasounds my baby has measured big, this last one he was 9 days bigger, that's crazy, I really hope he's not some massive baby but I also really hope my doctor will change my dates because of him measuring so big....but I don't know if she will. I actually have an appointment today and have a note on my phone with about fifteen questions to ask her, I've been a stress case the past few weeks and constantly worrying about my cervix even though the past appointment it measure great I am still so worried about having this baby too early, and by too early I mean before 24-25 weeks, not that i want him to come after that by ANY means, but at least he would have a chance at survival, where now he doesn't. it's depressing and I know I shouldn't think of it, but after Lincoln coming so early its hard not too worry! Anyways I will update more about our little guy soon.